For the eighth year in a row, WIAReport has surveyed the nation’s highest-ranking co-educational liberal arts colleges to determine the percentage of women in this year’s entering classes. This year, for the seventh time, we also report on gender differences in acceptance rates at these schools and whether women have made gains in enrollments at these colleges compared to where they were a year ago. We note here that several of the nation’s leading liberal arts colleges are educational institutions for women. These include Smith College, Bryn Mawr College, Wellesley College, Scripps College, and Mount Holyoke College. Because only women are admitted to on-campus undergraduate programs at these highly regarded colleges, they were not included in this survey which focuses on gender differences in enrollments and acceptance rates. There are wide variations in the percentage of women in the first-year classes at these highly rated liberal arts institutions. For the last five years in a row women made up the largest percentage of the entering class at Macalester College in St. Paul, Minnesota, among the liberal arts colleges for which we had data. A year ago, women make up 62.4 percent of the entering students at Macalester. But this year, women are just 55.6 percent of the entering class. 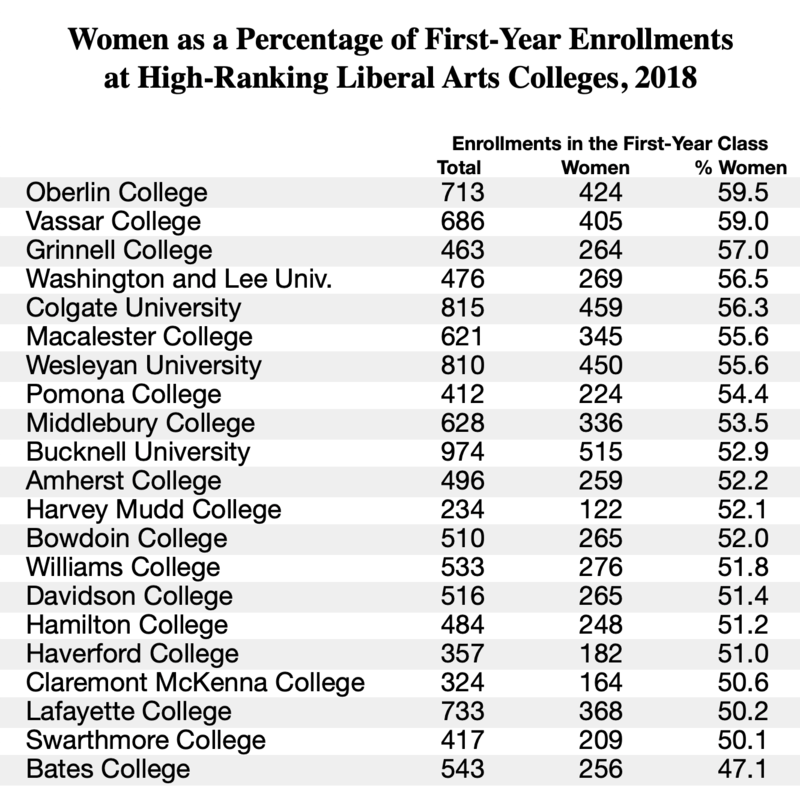 Among the leading liberal arts colleges in our survey this year, Oberlin College in Ohio has the highest percentage of women in its entering class. There are 424 women in Oberlin’s Class of 2022. They make up 59.5 percent of all first-year students. Vassar College in Poughkeepsie, New York, which was a women’s college until 1970, has an entering class that is 59 percent women. Grinnell College in Iowa, Washington and Lee University in Virginia, Colgate University in New York, and Wesleyan University in Connecticut, all have first-year classes that are at least 55 percent women. A year ago, men were a majority of the entering class at Washington and Lee University. Women make up only 47.1 percent of the entering students at Bates College in Lewiston, Maine. This is the lowest level of any college in this year’s survey. Bates is the only high-ranking liberal arts college in our survey, where men are a majority of the entering class. 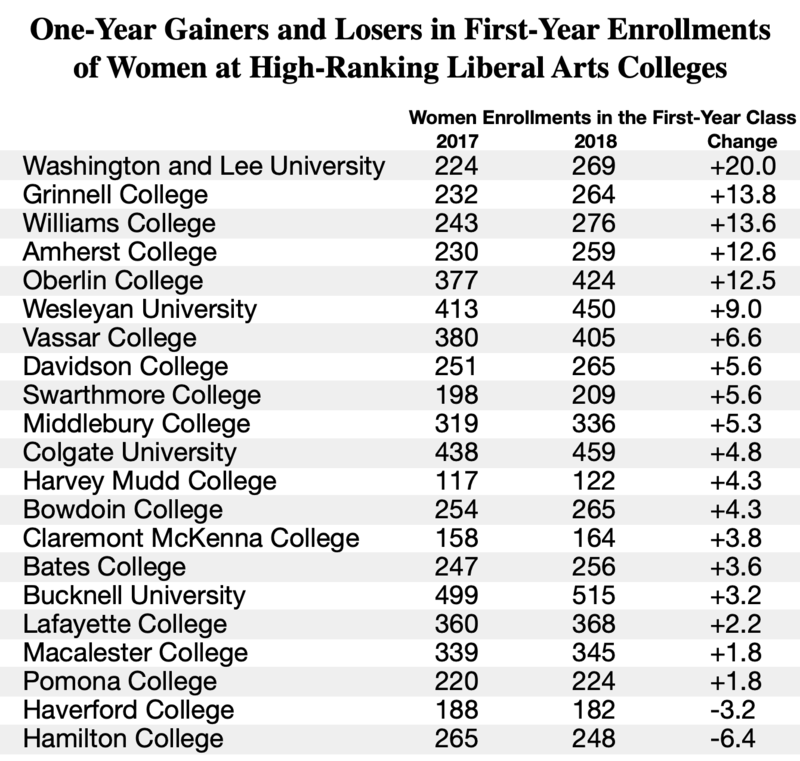 For the past several years, just about an even number of liberal arts colleges showed a one-year increase – or a one-year decrease – in the number of women in their entering classes. That is not the case this year. This year, 19 of the 21 liberal arts colleges in our survey showed an increase in the number of women in their entering classes. Only two showed a decline from a year ago. The largest increase of 20 percent occurred at Washington and Lee University in Lexington, Virginia. There are 269 women in this year’s entering class compared to 224 a year ago. The percentage of women in the entering class at Washington and Lee increased from 47.6 percent last year to 56.5 percent this year. Four other leading liberal arts colleges posted a double-digit percentage increase in first-year women students. They are: Grinnell College in Iowa, Williams College in Massachusetts, Amherst College in Massachusetts, and Oberlin College in Iowa. Last year, both Amherst College and Williams College had a majority of men in their entering classes. But this year women are a majority of entering students at both colleges. 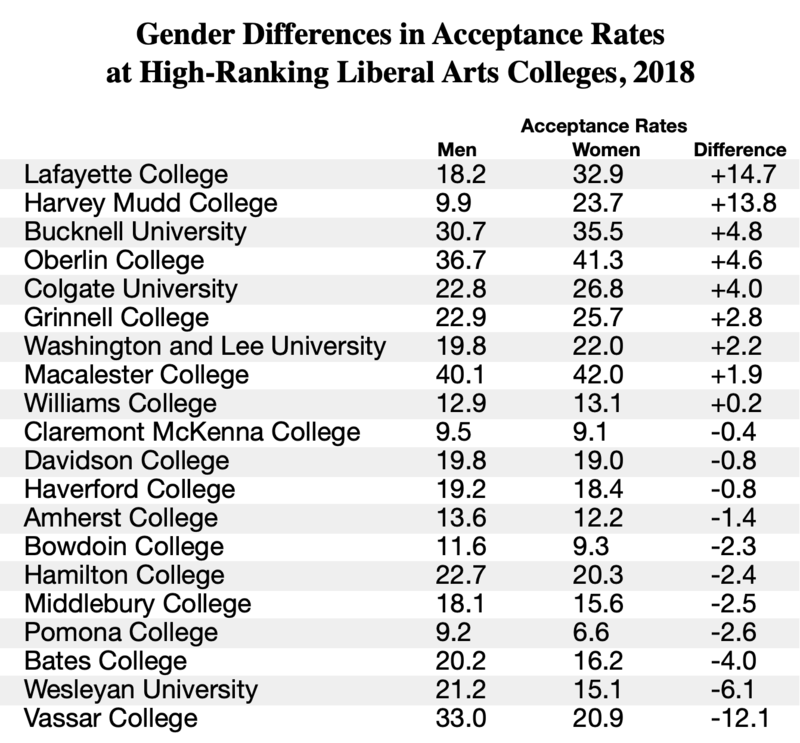 The only leading liberal arts colleges in our survey that showed a decline in the number of women in their first-year class are Hamilton College and Haverford College. But both of these colleges still have a majority of women in their entering classes. Bates College – as noted above – the only leading liberal arts college in our survey where men are a majority of the entering class, still showed an increase in the number of women in this year’s entering class. It is well known that nationwide women outpace men in college enrollments, graduation rates, and degrees earned. Because of a large and growing gender gap in enrollments at many colleges and universities, it has become easier for men to gain admission to some colleges and universities. Now, just because men have a higher acceptance rate than women at a given institution does not necessarily mean that men have received an unfair admissions advantage. A particular college or university may simply have had an outstanding pool of male applicants in a given year. We will simply present the data and let readers make their own conclusions. In most cases, differences in acceptance rates were small. Of the 20 highly rated liberal arts colleges that supplied data, we find that women were accepted at a higher rate than men at nine institutions. Men were accepted at a higher rate than women at 11 liberal arts colleges. The greatest difference in favor of women was at Lafayette College in Easton, Pennsylvania. At this highly rated college, 32.9 percent of women were accepted for admission compared to only 18.2 percent of male applicants. Thus, there was a very large acceptance rate gap in favor of women of 14.7 percentage points. Lafayette, which did not accept women until 1971, has a large contingent of engineering students, a field where women are traditionally not well represented. A year ago, the gender gap in acceptance rates at Lafayette College was 7.4 percentage points. Harvey Mudd College in Claremont, California, which is heavily focused on STEM disciplines, had the second-highest gender gap in acceptance rates in favor of women. At this highly rated college, 23.7 percent of women were accepted for admission compared to only 9.9 percent of male applicants. Thus, there was a very large acceptance rate gap in favor of women of 13.8 percentage points. A year ago, the gender gap in acceptance rates at Harvey Mudd College was 17.6 percentage points. At Bucknell University, Oberlin College, and Colgate University, the acceptance rate for women was at least 4 percentage points higher than it was for men. Vassar College had an acceptance rate for men in 2018 of 33 percent. For women applicants, the acceptance rate was 20.9 percent. At Wesleyan University, 21.2 percent of men were accepted for admission compared to 15.1 percent of women. Bates College was the only other high-ranking liberal arts college where the male acceptance rate was 4 percentage points higher than the rate for women.